This question is the million dollar inquiry. Surprisingly, it is asked by as many men as women. Many women experience tremendous pain. They do not know what to look for in a man and seek men with no true sense of manhood. The quest to discovering a real man is dark and troubling due to conflicting messages society gives us about manhood. What Does A Real MAN Look Like? Quite often, this question is answered with physical characteristics such as: tall, dark, handsome, blond hair, or blue eyes. This mindset is the major source of the problem. Society is so fascinated with the physical features of people that we overlook or pay very little attention to their emotional, mental, and spiritual state. 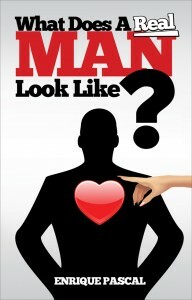 Click here to continue reading why Enrique wrote, “What Does a Real MAN Look Like” and order your copy today! Enrique Pascal was born in Panama, and he departed his native land at the age of five. His mother chose the borough of Brooklyn to be the place where she raised him and his sister. He adapted quickly to the fast-pace life and developed a hunger for better at an early age. “As long as I can remember, I always wanted more out of life. I recall growing up in New York wanting more than what the environment displayed to me.” Growing up in a fatherless home was very hurtful and challenging for Enrique, but it did not stop his drive. Actually, he used it as motivation. In 1993, Enrique began a successful promotion company named, “All or Nothing Productions.” His company became one of the most sought after companies in the entertainment industry. He arranged parties for many in the world of Hip-Hop. Also, Enrique worked closely with Jay-Z and Damon Dash as they formulated Roc-A-Fella Records. He was branded as “Tone Capone” aka the “Party Promoter.” Enrique’s gangster approach helped him to experience success at a high level. He was featured in several music videos on BET, MTV, and the movie, “Backstage.” In February of 1999, he was a part of the history making tour, “The Hard Knock Life” visiting fifty five cities in a ten week period. Enrique is a dedicated Husband, Father, Author, Speaker, and Host of Transformation Radio.